For many Russians, it is bad enough that Ukraine is pushing to join NATO and to eject the Russian Navy from its Black Sea port. But over the weekend, the confrontation over Ukraine’s attempts to shrug off Russian influence reached an even more emotional pitch — when the Ukrainian president sought to split his nation’s church from Moscow’s. It was the latest round in an increasingly fraught tug of war over history, identity and power. The two governments have fought with many different political weapons — from Ukraine’s threat to join Russia’s cold war rivals to Russia’s ability to shut off the natural gas deliveries on which its neighbor depends. Both quickly made it clear that the struggle over the church — traditionally an institution closely entwined with state power — was at least as important. On Saturday, President Viktor A. Yushchenko of Ukraine chose the 1,020th anniversary of the advent of Christianity in the Slavic kingdom that predated Ukraine and Russia — a date that each country claims as a founding event of its nationhood — to issue a plea for Ukraine’s Orthodox Christians to gain independence from the Russian Orthodox Church. The Ukrainian president — who claims that pro-Russian opponents tried to kill him with poison that pockmarked his face — also snubbed the Russian Orthodox patriarch, Aleksy II, by giving him a businesslike handshake after warmly kissing Bartholomew on both cheeks. But there was insulted pride and inflamed nationalism on both sides as well, and it was clear that it would be hard to resolve the dispute without causing a schism in the church, heating up ethnic tensions in Ukraine and deepening the division between Russia and Ukraine. 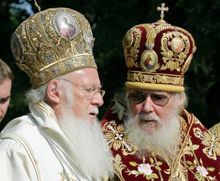 The possibility of a split in the church showed that behind the geopolitical bluster that the two countries have directed at each other since 1991 — when they each became independent after the fall of the Soviet Union — lies an identity crisis and a deep sense of loss. Many Ukrainians believe that the Russian empire and later the Soviet Union robbed them of the chance to develop a national identity, while many Russians feel that Ukraine is now claiming as its own a land and history that belongs to them as well. For Svetlana Dyomena, a nurse who prayed Tuesday at Yelokhovsky Cathedral in Moscow, the idea of an independent Ukrainian church immediately reminded her of her sadness over an independent Ukraine. Ms. Dyomena said it was less painful to see countries like Georgia seek to escape Moscow’s sphere of influence. Ukrainians disagree. Russian was the language of government and education in Ukraine under the Soviet Union and Russian empire, and Ukrainians struggled to maintain their own language. They view the absorption of the Ukrainian state and church into Russia’s institutions under Peter the Great as an annexation that was not reversed until 1991. 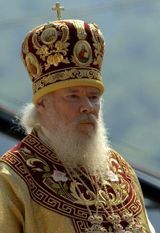 “How can you live like neighbors when your neighbor says the house you live in is not your own house, but our common house?” said Bishop Yevstratiy, the spokesman for one of two Ukrainian breakaway churches, the Ukrainian Orthodox Church Kyiv Patriarchate, which the Moscow Patriarchate has declared heretical. Establishing an independent church is essential for Ukraine to consolidate its national identity and statehood, and it would probably happen eventually, said Alexey Malashenko, an expert on religion and society at the Carnegie Moscow Center. When Ukraine left the Soviet Union in 1991, the new nation took with it much that was dear to Russia. Even historical tragedies are subject to the tug of war. There is a Ukrainian movement to convince the world that the famines that killed millions of Soviets during forced collectivization constituted a genocide aimed at ethnic Ukrainians — while many Russians object that their ancestors also starved after being stripped of their private land. But the biggest prize is the inheritance of Kyivan Rus, the kingdom that Prince Vladimir — Volodymyr to Ukrainians — converted to Christianity in the 10th century. Moscow church officials, who are close to the Kremlin, linked church unity to political efforts to maintain close ties among Slavic countries. Shots were even fired on Saturday — though they were blanks. Ukraine on Tuesday delivered a formal complaint to Russia over the firing of blanks from Russian naval ships at Sevastopol to celebrate Russian Navy Day. There is division within Ukraine over church independence. The idea is less popular in Ukraine’s mainly Russian-speaking, pro-Russian industrialized south and east than in the Ukrainian-speaking, Western-leaning part of the country west of the Dnieper River. Aleksy II canceled a planned trip to Donetsk, a pro-Russian city, citing health reasons, but he was widely seen to be either trying to avoid stirring up conflict by rallying his supporters, or to be leaving early because the Ukrainian president did not show him enough respect.